95 years on and the fascination with the Titanic is still as strong as ever. 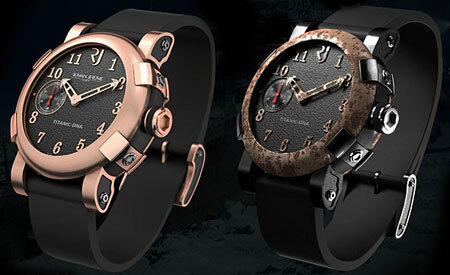 So picking up the Titanic DNA watch from Roamine Gerome could be a shrewd – if slightly morbid – investment. It’s made of steel salvaged from the hull of the sunken ship, which has been sitting on the sea floor off the coast of Newfoundland and Labrador for the past 95 years. You can choose different materials for the watch case, from the gold finish (left) to the extremely rusted steel (right). And the face is crafted from pieces of coal that were still loaded in the ship’s furnace, with the rest of the watch design mimicing the gauges and hatches aboard the Titanic. Obviously no-one is going to dive down and grab you bits of the boat on the cheap, so this limited edition watch (2,012 pieces) has a hefty price tag. How does $152,435 (£80,000) grab you?